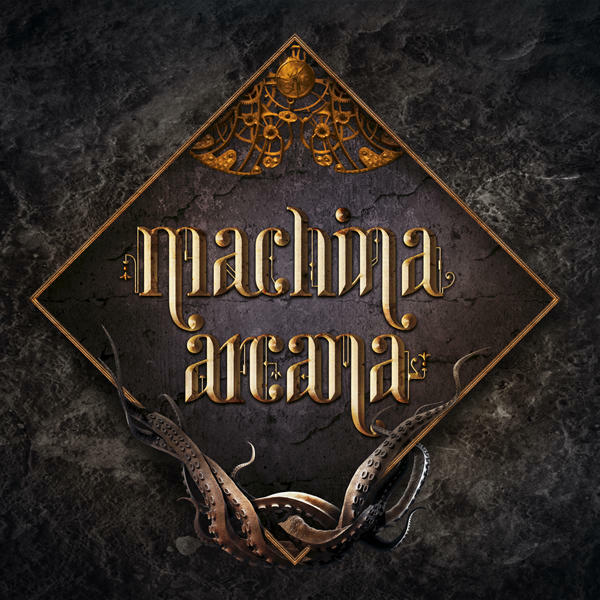 Machina Arcana is a cooperative steampunk & Cthulhu horror based board game for 1-4 players, where you are immersed into a dark, turn-based tactical dungeon crawl. If you survive, you win! As I previously mentioned in my review of Rise of Cthulhu, I love the Cthulhu Mythos. So, when I was offered the chance to review Machina Arcana, a co-op board game that mixes steampunk & my favorite Lovecraftian nightmares, I jumped at the chance. Now, that being said, I have to be honest and admit that I don’t know much about steampunk but I did go into this review with an open mind mainly because I understand that the Mythos cross and compliment many genres and themes. So how well does Machina Arcana pair these two genres into a horror game you should to add to your collection? Read on! 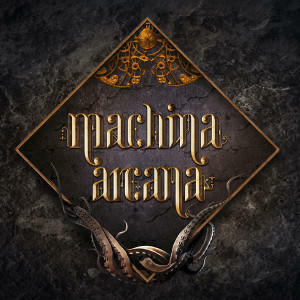 Machina Arcana is a cooperative game for 1-4 players runs between 40 and 120 minutes per player (depending on the mode). Machina Arcana plays best with 1-4 players. The object in Machina Arcana is to survive while meeting the chapter & then scenario conditions. Players do this while spending their explorer’s attributes to move, attack, and explore all the while interacting with elements on the board. Players will need to improve their character by increasing their attributes and finding treasure, all while surviving attacks from monsters pulled from both the classic Cthulhu Mythos, and also new ones created for this game. The explorers must improve themselves in a hope to overcome obstacles to advance the story. If they can do that, they will likely make it out alive. If all the explorers die, it’s game over. The game comes with a ton of components, including custom dice. The game comes with many different components, all of which are of great quality. There’s one negative and positive to be aware of with regard to the components as a whole. One thing that can be seen as a negative is that this game is a space hog. The following list is needed for starting setup of the game: Howling Mountain tile, chapter cards, explorer event Deck, horror event deck, treasure deck, explorer cards, monster deck, seven different player, monster, & map token/objects, and finally the map board. So, as you see this game will likely take up your table and then some if you have a full four players. The positive is that even with all the different decks, cards, tokens, map titles, etc. all pieces are of excellent quality and should hold-up to multiple game play. I have to say the designers really out did themselves top to bottom with tying these pieces perfectly into the genres and overall horror theme. From the flavor text to the artwork you get that steampunk and eerie Cthulhu horror feel the designers intended. The Exclusive Version, from the Kickstarter campaign, included two additional books: a Storybook and Bestiarium. Both add to the game’s two genres and overall horror theme. The Storybook was an original work that provides the full game background and origin of the Howling Mountain. This was an excellent piece of writing that not only adds to the game play but also to the Lovecraftian cannon. The Bestiarium gives background and monster tactics of Classic and new Mythos horrors. Both are excellent pieces that help set the mood and background of Machina Arcana. 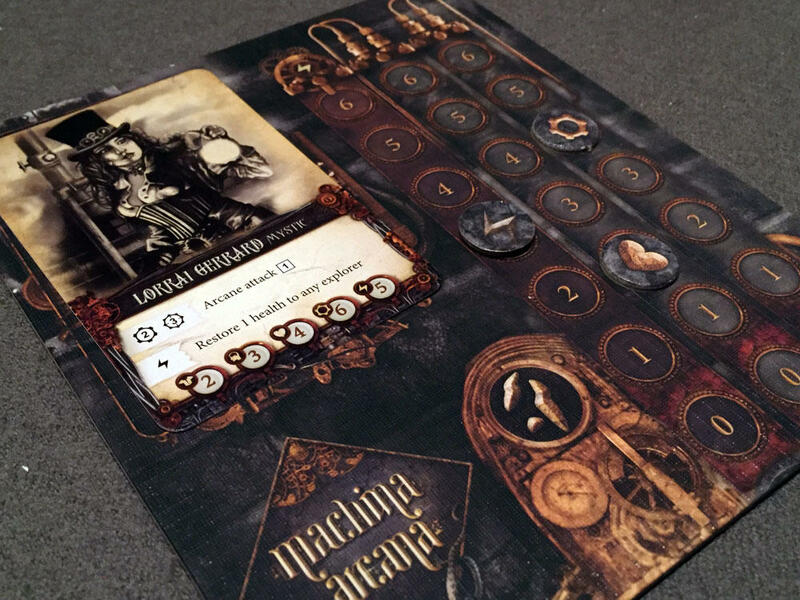 There are a number of different boards in Machina Arcana, including a main board to track your game’s progress. You really cannot talk about the components without emphasizing two points about the artwork. It all fits exceptionally well with the blended steampunk and Mythos genres. First the iconography used on the tokens, cards, manual, and maps titles. All of these elements are both decorative and functional to the rules. They are all easy to identify and use steampunk and Mythos-like symbols to distinguish each different piece. All seem to me to be purposely chosen for the specific decks, tokens, and map elements throughout Machina Arcana. Second are the illustrations. These again seem to be purposeful. They’re done in grayscale to give a feel that they were drawn by some neo-Victorian artist. All the images seem to radiate the mood of Machina Arcana by the fact that they are all done in dark tones of this sinister horror game. This style of art truly compliments both genres and the overall horror theme. If four-color images were used I believe this would have been a mistake. All images of the characters, monsters, and treasure give the game a creepy and weird authenticity to it. Each player gets to run a unique explorer, each with their own unique stats and special abilities. Explorer Phase: – Meat & potatoes for the player’s characters (explorer): they can move, attack, play abilities and interact with other map elements by spending their attribute points. Monster Spawn –Every player rolls a d10 and compares the result with the spawn value of the current chapter. If the roll is equal or greater a monster card is drawn and that monster is placed on a spawn monster icon on the map. 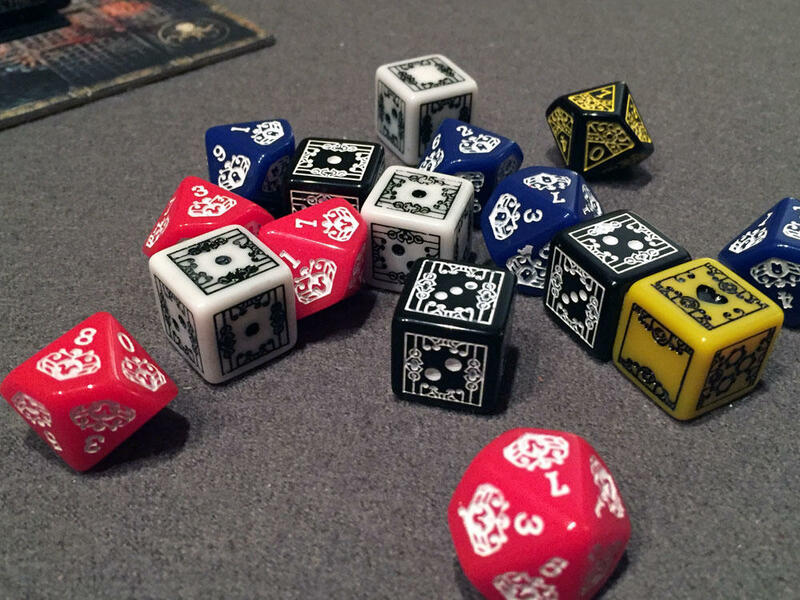 Horror Phase – One player rolls a d10 and compares the result with the horror value of the current chapter. If the roll is equal or greater a horror event is drawn. These will always harm or harass explorers and some even cause ongoing effects. Monster Action – Meat & potatoes for monsters: players will now act and move monsters following the monster action rules outlined in the game manual. These rules are straight forward to play. Monsters either have abilities they can use if they are able to and if not then they are to move towards the nearest explorer. There’s a variant rule (Puppet Master) this suggests allowing a fifth player to be the game master and has control over the monster (think Overlord in Descent), I like this because then you can add another player and not have the players do silly things with monsters. There are two things to note about the rules and game manual itself. First, the number of players is directly related to the number of monsters spawned so the game scales up and down accordingly. This aspect of the rules really balances the game well. So, no matter the number of players you use should give you a fighting chance to win the game and not be too over or underwhelmed during the game play. The second to note is the game manual itself. It’s packed full of information and you should read it cover to cover before attempting to play. Now, I don’t find this to be a negative. It could have been organized better but to be fair there’s a lot to digest. If you try to pick this up cold without a once through, then it will likely diminish your initial game play. There are rules towards the front and back that players should be aware to maximize game play. Also, the rules in the first two-thirds of the manual reference the Intro Mode of game play. 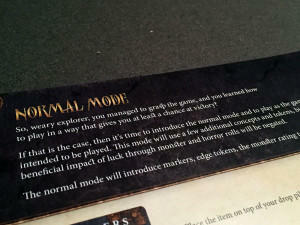 It’s not until the back half of the manual where you get to Normal Mode. Be sure to start with the Intro Mode and then move to Normal when you think you fully understand the rules. Players must move around the game’s modular board to fight monsters, interact with objects, and find upgrades. As I stated at the beginning, I didn’t know much about steampunk. Well, you don’t really need to with Machina Arcana. The designers give you plenty of detail and background to understand the world and the explorers. So you don’t need to be scared off if you’re not knowledgeable or a fan. The steampunk genre fits seamlessly with the Mythos and to be honest, I think it does better than most. You could possibly plug-in another genre but the designers again were purposeful to use the neo-Victorian mixed with Mythos images for the artwork and decorative elements. Overall, when you first open the box the steampunk images and dark tones give you that creepy and weird feeling that you should expect to find with Cthulhu based horror games. This was an excellent pairing of genres for this horror theme. Players will find a large variety of weapons and equipment, some of which can be modified. Out of the gates, I really liked this game. At first glance it seemed like a simple cooperative dungeon crawl mixed with horror and suspense but it was more than that. The game has a huge amount of variety and comes with a robust and progressive rules set. The overall variety comes in the number of different elements to choose from including: 10 explorers, 26 monsters (1-4 levels), 3 scenarios, 24 chapters, 86 explorer & horror event decks, 90 treasure deck (1-3 levels), and 12 map tiles. All this variation makes each game play unique and makes the replay value off the charts. I played the Exclusive Version which provided more add-ons for almost all of the above and more importantly a bonus scenario which is huge for replay. The overall rules and iconography are not difficult to understand but there’s simply a lot of information to absorb. This is why I thought a key to the rules was starting players off with the Intro Mode. This is a masterful why to teach the game. It tells you up front and lets you get through some of the herky-jerky first game experience in a more toned down difficulty environment. Yes, explorers will die in the Intro Mode but it’s a much easier mode because there will be less monsters spawning, less chance to trigger a horror event, and it uses a reduced chaptered scenario. It really gives players (and possible Puppet Masters alike) the chance to understand and master the rules. I have to add if you never stop playing the Intro Mode then you’re really missing out in the intended game experience. The second half of the rulebook takes players from the intro mode to the normal mode. The training wheels come off in Normal Mode. Now, you experience the game at full spawn and event speed (see what I did there). Yes, you are still beholding to the luck of the die but the percentage chance now increases and the scenario is full chapter sized. The full chapter scenario does make the time commitment increase significantly but time should fly by as you run for your life and watch your explorer trying to stay alive. I really enjoyed when my group moved from Intro to Normal Mode. Machina Arcana did get much more difficult and significantly increased the need for the players to be more cooperative. It can be difficult to the point of frustration but much more rewarding when your explorer makes it out alive. It’s also worth noting that there’s very little downtime between turns and rounds which move either mode along. With the cooperative aspect each player should be engaged and discussing the best course of action per player and overall group. There’s one cool mechanic I want to mention that allows you to draw another explorer if yours is pushing up daisies. You might think that this unbalances the game and will make the game too easy, but oh contraire mon frere. This mechanic keeps all players in the game and continues the collective fun. Explorers must keep improving their attributes by overcoming specific board elements and collecting treasure items. There’s an increasing chance that monsters will be going up in level the more monsters are spawned. So, if you lose your explorer when you’re stacked with buffs and items, you now get a new explorer with none of that. Your new explorer will face the same horrors as the dead one but without all that great stuff. This is what our group called “running mode.” This further escalates the need for cooperation and remember don’t kill all 12 explorers because unlike the monsters they don’t re-spawn and the game will end in failure (insert sinister laugh). There are a large variety of thematic monsters in Machina Arcana, all controlled by the game’s AI (or possibly Puppet Master). It’s obvious to see and I really have to applaud the overall thought, intension, and effort of the designers. Their work makes Machina Arcana an easy must have and play for me. The game was built with quality components top to bottom. 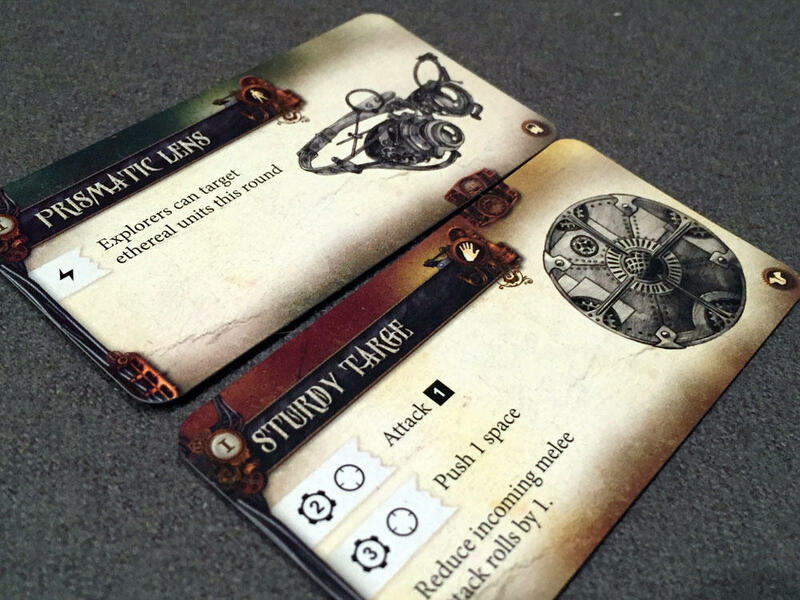 It mixes the two genres steampunk and Cthulhu that complement each other very well and help set the dark and sinister tone for this horror themed tactical dungeon crawl. The game itself was difficult when you play it as intended but any gamer worth his salt isn’t looking for a cake-walk. If you want to be challenged and battle horrors from beyond then I highly recommend buying this game. If you don’t want to be challenged then pass on this game and regret it. Machina Arcana was as fun as it looks, absolutely worth getting. This one will be in my collection for a long while. Now that said the Machina Arcana team looks to be setting up a new site at machinaarcana.com but was not ready yet at the time of this review. Unfortunately, if you’re looking for a copy it’s only available on secondary markets right now. If you are interested in getting a copy of Machina Arcana, you can pick it up for about $90-100 on the secondary market. 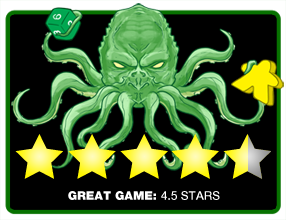 Final Score: 4.5 Stars – A well-built game with huge replay value. 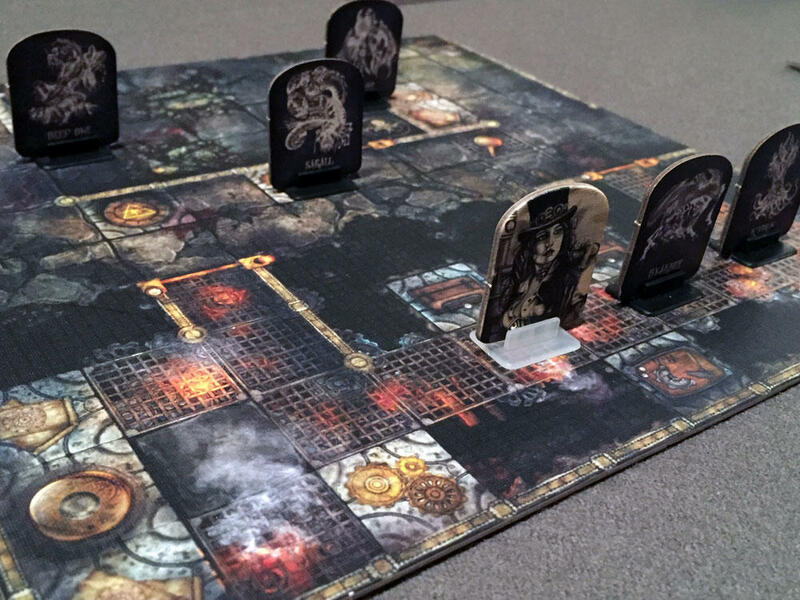 A must have for any gamer that enjoys a challenging horror themed tactical dungeon crawl. When is this game going to hit stores? their site is less than informative. We are doing the heavy duty surgery of the site. I’m in the process of making the reprint + expansions of the game. I feel that in the coming weeks the stars will be right for a detailed plans for Machina Arcana. It sounds VERY similar to Eldritch Horror. Did you find the games similar with just a different playset of rules? I can’t speak for brian, but I found it REALLY different from Eldritch Horror. This one is a lot more tactical. Really the only similarity is on theme. I’m with Tony. I own and have played both and I’ve found both to have a very different game experience. There are similar elements that cross both games like the cooperative play but even the level of cooperation differs greatly. 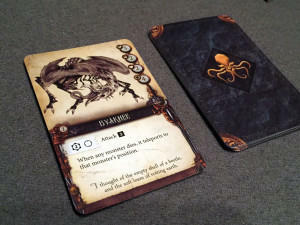 In my opinion the tactical nature of Machina really sets it apart from Eldritch Horror. The chapter and scenario goals give players things to plan out and overcome as well as map elements. 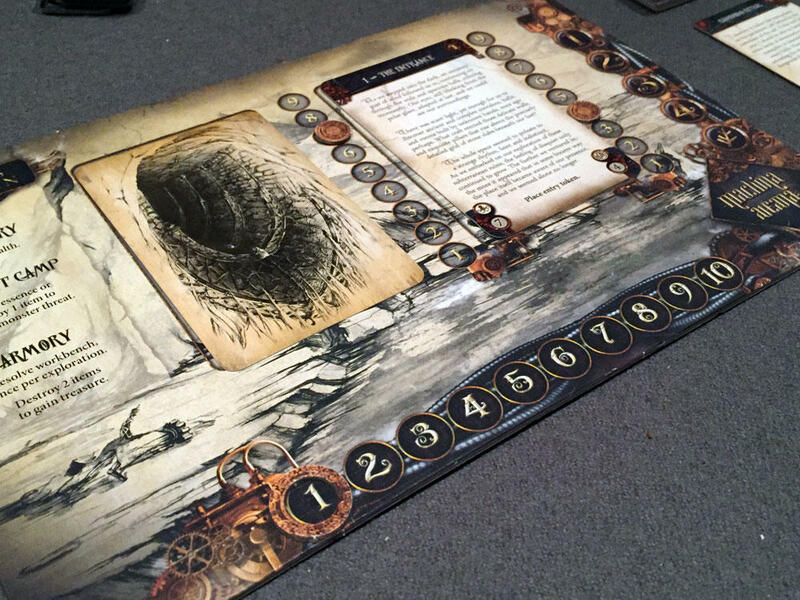 I found Eldritch Horror to be more a reactive game that has players map trotting to stop random mythos encounters.